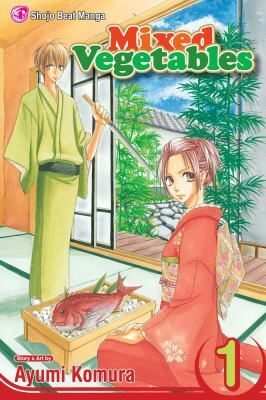 Hanayu, daughter of a pastry chef, plans to marry Hayato, the son of a sushi chef and heir to the Hyuga family restaurant, so that she can become a famous sushi chef. Ironically, Hayato dreams of becoming a famous pastry chef. Together, Hanayu and Hayato realize their dreams – although, not in the typical shoujo romance way. Mixed Vegetables shows you that courage and dedication are required to fulfill your dreams. PBCLS currently owns all 8 volumes of this romantic series. Reserve book one now. Rara isn’t your typical high school transfer student. In fact, she’s a demon sent to the human realm to wreak havoc while she builds up her powers. She immediately falls for a human classmate who she mistakes for a demon pop idol. The downside – demons who use their magic for the sake of a human lose their powers and eventually dematerialize. Will Rara make the ultimate sacrifice for the man she loves? You’ll find out soon! Gaba Kawa is a one-shot shojo manga that is cute, fun, and heart wrenching all at once. Author and illustrator, Rie Takada fits a lot into one volume, but I wouldn’t mind seeing this as a series. She introduces a world of characters and could easily stretch the story out over several volumes to give detail and better flow to plot points (read as: I WANT MORE! :F). Rie Takada is also known for her other works including WILD CAT and Happy Hustle High. Long time no see, manga fans! I promised you a review of MeruPuri by Matsuri Hino, and here it is. MeruPuri is the newest title released by Matsuri Hino (of Vampire Knight and Wanted fame and a personal favorite). It’s the story of Airi, who believes that she will find her soul mate and lead a simple life like those she watches in Tales of Marriage on the Prairie, her favorite TV drama. Enter Aram, a prince from the magical land of Astale, who is cursed to age when left in the dark. Airi discovers the curse when the prince uses her mirror as a magical gateway to our world. The only thing that can return Aram to his true age is the kiss of his chosen maiden, and he’s chosen Airi. Airi’s promised to save her kisses for her soul mate. Wil she be able to break the curse? MeruPuri is full of cute and funny moments, and the art style is very similar to that of Vampire Knight. Matsuri Hino always puts her characters into beautiful and elaborate costumes. The story takes a bit of a darker turn when Aram’s brother shows up and makes a play for Airi, and I liked that. If you are a fan of Matsuri Hino, check out MeruPuri, but if this is your first exposure to her work, check out Vampire Knight first. When she transfers to an elite high school, Kasumi (who loves magic) is convinced that she’s going to wow her new classmates with her magic tricks, but when her efforts are mocked by the snobby class president and his fan club, Kasumi discovers that she has real magical powers! She can turn invisible when she holds her breath. This is one trick that Kasumi has to keep a secret, but can she do it when the whole school is watching her? If you like magical girl manga, check out Kasumi. We have the first three volumes of Peach Fuzz, a manga by Lindsay Cibos and Jared Hodges that can be read by anyone. Peach Fuzz was first brought to my attention when a young patron told me that two of the main characters were named Amanda and Mimi! So, of course, I had to read it. Peach Fuzz is about a young animal lover named Amanda who chooses a ferret named Peach for a pet. Her mother has been warned by the pet store clerk that ferrets have a tendency to bite. So, she tells Amanda that if Peach bites, they are returning her to the pet store and getting Amanda a fish. In Peach’s point of view, she has been kidnapped from her kingdom of Ferretland by the evil Handra and must defend herself tooth and nail. Will Amanda and Peach make friends before Amanda’s mother decides to take Peach back to the pet store? Put a hold on Peach Fuzz here. Wanted: one incredibly handsome pirate and one beautiful, talented songstress for story of love and adventure on the high seas. Found! To find her lost love, Armeria disguises herself as a boy and sails with the crew of the pirate Skulls. Skulls is handsome and dangerous, and it’s not long before he finds out Armeria’s secret. Is her quest over before its begun? Wanted is beautiful! The art is gorgeous. The story is sweet, and it’s got pirates! While the big twist is fairly easy to spot, this is a very enjoyable read especially for fans of shoujo manga (and fans of pirates ^_~). Want to check out Wanted? Put a hold on it here. Emma is a manga about a shy young woman who is a maid in Victorian London. Emma is pursued by many aristocratic young men, but she refuses them all until she meets her employer’s former student, William Jones. Kaoru Mori, the creator, is a huge Anglophile, which explains why Emma reads like a Jane Austen novel. It begins a little quietly with a simple flirtation between Emma and Mr. Jones, but soon, there’s all the trappings of an Austen novel: meddling family and friends, a love triangle, and of course, pride and prejudice. Also, don’t forget to check out the afterword manga, “Maids in Black” which is a humourous look at how Kaoru Mori went through the process of creating Emma. Put a hold on Emma.